Fanny Mendelssohn (14 November 1805 – 14 May 1847), later Fanny [Cäcilie] Mendelssohn Bartholdy and, after her marriage, Fanny Hensel, was a German pianist and composer. She composed over 460 pieces of music. Her compositions include a piano trio and several books of solo piano pieces and songs. A number of her songs were originally published under Felix's name in his opus 8 and 9 collections. Her piano works are often in the manner of songs, and many carry the name Lied ohne Worte (Song without Words). She also wrote, amongst other works for the piano, a cycle of pieces depicting the months of the year, Das Jahr ("The Year"). The music was written on coloured sheets of paper, and illustrated by her husband Wilhelm . Each piece was also accompanied by a short poem. Fanny Mendelssohn was born in Hamburg, the oldest of four children. 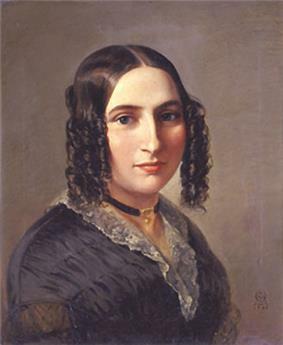 She was descended on both sides from distinguished Jewish families; her parents were Abraham Mendelssohn (who was the son of philosopher Moses Mendelssohn and later changed the family surname to Mendelssohn Bartholdy), and Lea, née Salomon, a granddaughter of the entrepreneur Daniel Itzig. She was not however brought up as Jewish, and never practised Judaism, though it has been suggested that she "retained the cultural values of liberal Judaism". She was the sister of the composer Felix Mendelssohn. Fanny received her first piano instruction from her mother, who had been trained in the Berliner-Bach tradition by Johann Philipp Kirnbergers, who was himself a student of Johann Sebastian Bach. Thus as a thirteen year old, Fanny could already play all 24 Preludes from The Well-Tempered Clavier (Johann Sebastian Bach) by heart, and she did so in honor of her father's birthday in 1818. She studied briefly with the pianist Marie Bigot in Paris, and finally with Ludwig Berger. In 1820 Fanny, along with her brother Felix, joined the Sing-Akademie zu Berlin which was led by Carl Friedrich Zelter. Zelter at one point favored Fanny over Felix: he wrote to Goethe in 1816, in a letter introducing Abraham Mendelssohn to the poet, 'He has adorable children and his oldest daughter could give you something of Sebastian Bach. This child is really something special'. 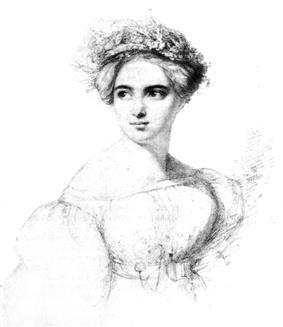 Much later, in an 1831 letter to Johann Wolfgang von Goethe, Zelter described Fanny's skill as a pianist with the highest praise for a woman at the time: "She plays like a man." Both Fanny and Felix received instruction in composition with Zelter starting in 1819. Fanny showed prodigious musical ability as a child and began to write music. Visitors to the Mendelssohn household in the early 1820s, including Fanny von Arnstein and Sarah Levy, both lovers of music, the former the patroness of a well-known salon and the latter a skilled keyboard player in her own right. 'From my knowledge of Fanny I should say that she has neither inclination nor vocation for authorship. She is too much all that a woman ought to be for this. She regulates her house, and neither thinks of the public nor of the musical world, nor even of music at all, until her first duties are fulfilled. Publishing would only disturb her in these, and I cannot say that I approve of it'. The siblings shared a great passion for music. Felix did arrange with Fanny for some of her songs to be published under his name, three in his Op. 8 collection, and three more in his Op. 9. In 1842 this resulted in an embarrassing moment when Queen Victoria, receiving Felix at Buckingham Palace, expressed her intention of singing the composer her favourite of his songs, "Italien", which Mendelssohn confessed was by Fanny. In turn Fanny helped Felix by constructive criticism of pieces and projects, which he always considered very carefully. Their correspondence of 1840/41 reveals that they were both outlining scenarios for an opera on the subject of the Nibelungenlied: Fanny wrote 'The hunt with Siegfried's death provides a splendid finale to the second act'. In 1829, after a courtship of several years, Fanny married the painter Piano Concerto No. 1. In 1846, she decided, without consulting Felix, to publish a collection of her songs (as her op. 1). Fanny Hensel died in Berlin in 1847 of complications from a stroke suffered while rehearsing one of her brother's oratorios, The First Walpurgis Night. Felix himself died less than six months later from the same cause (which was also responsible for the deaths of both of their parents and of their grandfather Moses), but not before completing his String Quartet No. 6 in F minor, written in memory of his sister. In recent years, her music has become better known thanks to concert performances and a number of CDs being released on labels such as Hyperion and CPO. Her reputation has also been advanced by those researching female musical creativity, of which she is one of the relatively few well-documented exemplars in the early 19th century. See also List of compositions by Fanny Mendelssohn. Fanny Mendelssohn composed over 460 pieces of music. Her compositions include a piano trio and several books of solo piano pieces and songs. A number of her songs were originally published under Felix's name in his opus 8 and 9 collections. Her piano works are often in the manner of songs, and many carry the name Lied ohne Worte (Song without Words). This style (and title) of piano music was most successfully developed by Felix Mendelssohn, though some modern scholars assert that Fanny may have preceded him in the genre. I have been composing a good deal lately, and have called my piano pieces after the names of my favourite haunts, partly because they really came into my mind at these spots, partly because our pleasant excursions were in my mind while I was writing them. They will form a delightful souvenir, a kind of second diary. But do not imagine that I give these names when playing them in society, they are for home use entirely. She was the grandmother of the philosopher Paul Hensel and the mathematician Kurt Hensel. ^ Fanny Mendelssohn: Her Life and Music, musicforpianos.com. Retrieved on 20 July 2009. ^ Citron, Marcia J. The Letters of Fanny Hensel to Felix Mendelssohn. Citron, Marcia J. Mendelssohn, Fanny In Grove Music Online (subscriber access). Oxford Music Online, (accessed 13 February 2010). Hensel, Sebastian. The Mendelssohn Family 1729–1847 4th revised edition, 2 vols., Sampson Low, London, 1884. This compilation from family correspondence still remains an important source of information about Fanny, Felix and their relatives. Mendelssohn (Hensel), Fanny, tr. and ed. Marica Citron. The Letters of Fanny Hensel to Felix Mendelssohn (New York, 1987). Mendelssohn Bartholdy, Felix, ed. Paul Mendelssohn Bartholdy, tr. Lady Wallace. Letters of Felix Mendelssohn Bartholdy from 1833 to 1847, Longman Green, London 1864.